Sheldon Vanauken is most well known to the world for his autobiographical book A Severe Mercy which contains 18 letters written to him by C. S. Lewis. I first read A Severe Mercy in the late 1970s. What impressed me most about the book was that it gave me the same experience of "joy" which I received from reading some of C. S. Lewis's books. The Oxford chapters were and are my favorite parts of A Severe Mercy. When I later spent time in Oxford on vacation, I recalled Lewis's words to Vanauken from across the busy High Street outside the Eastgate Hotel: "Christians never say goodbye!" During my years at Princeton Seminary I wrote to Sheldon Vanauken and invited him to speak to a student group on campus. He wrote back a polite, hand-written postcard declining the invitation. However, at the end he said: "If ever you come down to the South, you will be welcome to stop by." Years passed and I eventually moved to "the South". I decided to take Vanauken up on his invitation and so, on a whim, wrote to him again. He re-issued his kind invitation to come and visit him. So I traveled to Lynchburg and spent time with Vanauken on two occasions in 1996. We also exchanged about 17 letters or postcards during that same year--discussing many topics--C. S. Lewis, Catholicism and Van's own books. Part way through the correspondence Sheldon Vanauken invited me to call him Van. One of the highlights of that year was the publication of Van's last book: The Little Lost Marion and Other Mercies. Sadly, my correspondence with Van came to an end with his death from cancer in October 1996. His last postcard to me was written just three days before his death. The highest praise Van ever gave me was the note he wrote in Davy's Edition of A Severe Mercy when he autographed it for me: For Will Vaus--a good correspondent. I had the privilege of attending Van's memorial service at St. Stephen's Episcopal Church and meeting a number of his friends. I was blessed to be just one of many of Van's correspondents. 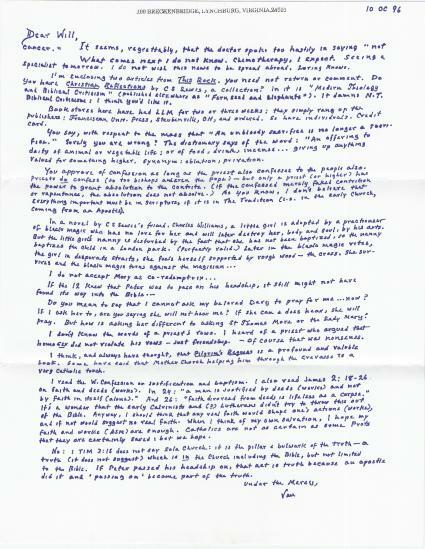 He graciously wrote back to every person who wrote to him, most often by return of post, either using the same typewriter on which he wrote A Severe Mercy, or handwriting the letter with his own, very neat penmanship. My letters from Van still carry the scent of his beloved tobacco.